It’s called mindfulness. It’s a technique used in certain types of meditation. But it has a wide variety of applications. It promotes relaxation, clarity of thought, and reduces anxiety. The new study from Britain’s University Hospitals Coventry and Warwickshire National Health Services Trust looked at mindfulness in connection to eating behavior. Mindfulness means being aware of the present. You try to focus on what’s going on around you and the effects those things have on you. At the same time, you acknowledge but don’t dwell on whatever memories or thoughts of the past or future enter your mind. The researchers recruited subjects who were trying to lose weight. Thirty-three of them attended up to four mindful eating lessons. A control group of 20 people had no mindfulness training. Subjects who had four mindfulness lessons lost an average of 6.3 pounds more than those who had no mindfulness training over six months. Dr. Thomas Barber was a senior author of the study. <Mindfulness has “huge potential as a strategy for achieving and maintaining” good health and well-being, he said. The study confirms previous findings at North Carolina State University. Researchers there found that mindful eaters lost an average of six times as much weight as those on traditional diets. Mindful eating is not difficult. It is centered around the idea that you should think about what you’re eating instead of mindlessly shoveling in food. Follow the 20-minute rule. Before you start eating, set any kind of timer for 20 minutes. This is the minimum amount of time eating a meal should take. Your brain takes that long to recognize you are full and send satiety signals. Focus on your food. When you sit down to eat, you should be free of distractions. Turn off the TV. Put your cellphone or tablet out of reach. Don’t read at the table. If you’re eating with someone, eat silently for the first five minutes. When you do talk, try to keep the conversation focused on the meal. Eat like a food critic. They don’t rush through a meal. Instead, they savor and think about the food they are eating. Study the visual qualities of the meal. Note the colors and textures of what’s on the plate. Concentrate on the aroma. Make your first bite small. Pay attention to the first flavors you experience. As you chew, note how the food feels in your mouth. Focus on how the flavor of what you’re eating changes as you chew. Chew your food thoroughly. Chew each bite at least 10 times. Chewing begins the chemical process of digestion. Enzymes in your saliva break down the food. This helps food pass through your intestines and you feel fuller, quicker, making it easier to eat less. 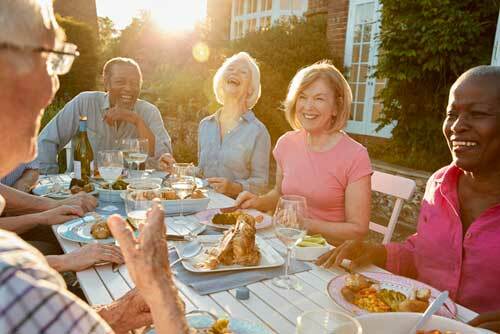 Mindful eating not only lets you gain control of your eating habits, it can make meals more relaxing and enjoyable…while helping you lose weight.